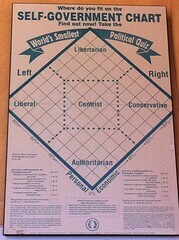 That political chart reminds me of the Political Compass web site. The folks there explain why the two axis political position chart is much more helpful than the standard left-right one. They also include a quiz that allows you to plot your position on their chart and compare it to famous political leaders.